Climate change and other critical environmental challenges are reshaping economic policy and practice. 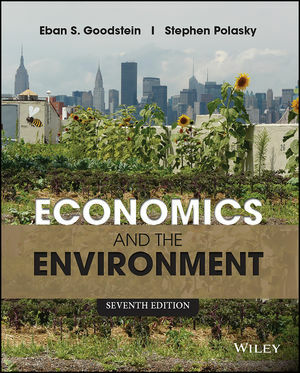 In the 7th edition of Economics and the Environment, Dr. Eban Goodstein and new co-author, Dr. Stephen Polasky, provide students with a clear, concise, and comprehensive presentation of environmental and resource economics. The text also offers a compelling look at broader topics including the ethical foundations of environmental economics, the promotion of ‘‘clean technology”, and the challenges of sustainable development. With a unique framework and compelling narrative style, Goodstein & Polasky provide a timely synthesis of the economic tools available for understanding and solving environmental problems that are crucial for today’s students to consider for tomorrow’s world. Eban Goodstein is Director of the Bard Center for Environmental Policy and Director at The National Teach-In. He received his B.A. from Williams College and Ph.D. from University of Michigan. Prior to Directing the Bard Center for Environmental Policy, Goodstein had a 20-year career as a Professor of Economics at Lewis & Clark and Skidmore Colleges. Goodstein also led the National teach-In on Global Warming Solutions, coordinating educational events at over 2500 colleges, universities, high schools and other institutions across the country. He is the author of a college textbook, Economics and the Environment, (John Wiley and Sons: 2010) now in its sixth edition; Fighting for Love in the Century of Extinction: How Passion and Politics Can Stop Global Warming (University Press of New England: 2007); and The Trade-off Myth: Fact and Fiction about Jobs and the Environment (Island Press: 1999). Articles by Goodstein have appeared in among other outlets, The Journal of Environmental Economics and Management, Land Economics, Ecological Economics, and Environmental Management. His research has been featured in The New York Times, Scientific American, Time, Chemical and Engineering News, The Economist, USA Today, and The Chronicle of Higher Education. He serves on the editorial board of Sustainability: The Journal of Record, and Environment, Workplace and Employment, is on the Steering Committee of Economics for Equity & the Environment, and is a Member Scholar at the Center for Progressive Reform. The 7th Edition welcomes Dr. Stephen Polasky as a co-author, who brings to the text a reworked and stronger focus on natural resource economics and ecosystem services. The formerly separate chapters on Neoclassical and Ecological Economics have been reworked into two new chapters: The Sustainability Standard (Chapter 8) and Measuring Sustainability (Chapter 9). Chapters on Measuring Benefits (Chapter 6) and Measuring Costs (Chapter 7) now precede the sustainability discussion. New chapter on Natural Resources and Ecosystem Services (Chapter 10) covers optimal non-renewable resource extraction; predictions about price paths; optimal renewable harvesting strategies; and the new economics involved in estimating the value of jointly produced ecosystem services. The discounting discussion has been reframed around the Ramsey equation. It is made clear that discounting at a positive rate only makes sense if weak sustainability is assumed. Four Clearly Focused Questions organize the text’s theories and applications in a way that students can easily understand. 1.) How much pollution (or resource degradation) is too much? 2.) Is government up to the job? 3.) How can we do better? 4.) How can we resolve global issues? Balanced introductory coverage of neoclassical versus ecological approaches to sustainability. Dual chapters explore the longstanding controversy. Accessible for both economics and environmental studies students. No matter what the students’ background or attitude, the text invites the students to learn more. Student-friendly writing style and puzzles encourage students to learn more about substantive topics such as depreciating stocks of oil and other natural capital.